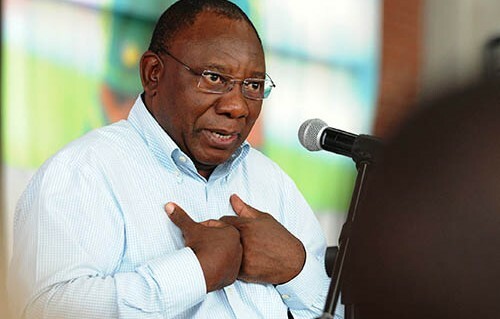 A fresh bid to nullify the election of President Cyril Ramaphosa as ANC leader is under way, with unhappy party members claiming that Ramaphosa was elected by bogus Mpumalanga branches at the party's national elective conference in Nasrec, southern Johannesburg, in December. This is the latest development as sharp divisions within the ANC continue to hinder Ramaphosa's unity project and weaken the party further ahead of next year's general election. Concerned ANC members, including unsuccessful presidential candidate Mathews Phosa's former campaign manager, Ronnie Malomane, submitted supplementary documents to the Mpumalanga Circuit Court of the Pretoria High Court last week on Friday in a bid to have the party's Mpumalanga provincial executive committee (PEC) disbanded and a task team appointed. The court postponed the case to December 13. If the court action succeeds, this could have far-reaching implications for Ramaphosa's legitimacy as ANC leader. Delegates from Mpumalanga played a critical role in his election. Concerned members allege that the PEC was elected illegally because bogus branches were allowed to participate at the provincial conference in 2015. At that conference David "DD" Mabuza, who is now the country's second-in-command, was re-elected for a third term as the provincial chairperson. They are complaining that "illegitimate" branches held general meetings in preparation for the list conference to select candidates for the provincial legislature and National Assembly. He said this meant the credentials that were adopted at the ANC's national elective conference in Nasrec were illegal, as bogus branches participated at the conference. "Mpumalanga came to the Nasrec conference with 508 branches; 108 bogus branches participated in the Nasrec conference. I fear that something bad is going to happen. We have been talking to Luthuli House but they are dilly-dallying," he said. Malomane warned that the ANC would be disappointed if the issue was not resolved amicably. "They say we must talk to the province. How do you talk to a perpetrator? We are now pulling the trigger. The court will help us," he said. The ANC's national executive committee member deployed in Mpumalanga, Gwen Ramokgopa, said the issue would be approached in a "comradely" manner. "All I can say now is that we facilitated a process of dialogue and identified areas of dispute. We trust the process will be approached in a comradely manner to ensure that all constitutional obligations are met and to foster unity," Ramokgopa said. She said the ANC had to focus more on improving services to ordinary citizens. The ANC in Mpumalanga is still battling to fill vacancies that were created within the PEC after Mabuza, his former deputy Violet Siwela and PEC member Mashego Dlamini were elected on to the ANC national executive committee at the party's national conference in December. Malomane accused Mabuza of imposing his own successor on the ANC in the province. "Currently ANC provincial leaders are conflicted. Remember DD Mabuza said he wanted Mandla Ndlovu to succeed him. We don't have a chieftaincy in the ANC. Mandla can't lead us. He can't even make his own decisions. We have nothing against Mabuza, we just want him to stop controlling the province remotely," he said. Malomane said they were backing former PEC member Peter Nyoni to become the provincial chairperson. ANC Mpumalanga acting secretary Lindiwe Mabona-Ntshalintshali said the party would respond at an "appropriate" time.